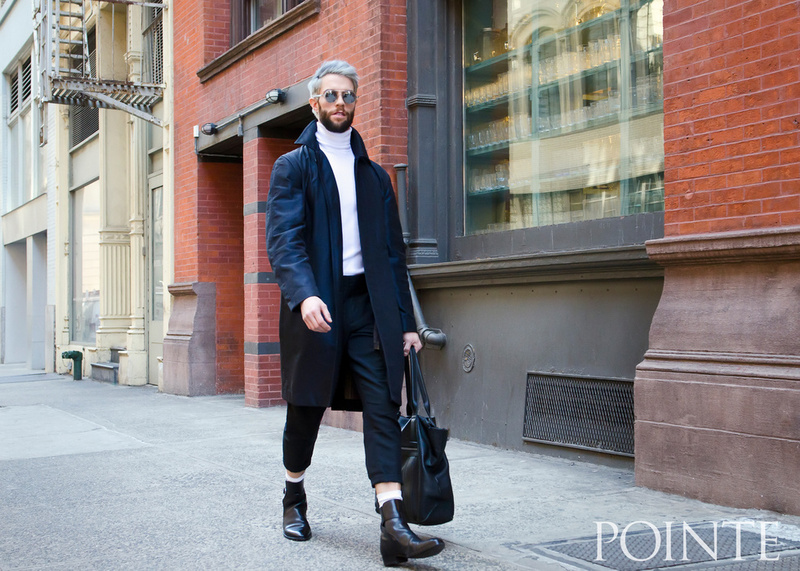 When it comes to style, James Whiteside likes to push the limits. “Conforming isn't really my thing," says the American Ballet Theatre principal. He chooses pieces that express his personality, while always leaving room to experiment with new ideas. “I haven't really married myself to one aesthetic, and that gives me a lot of options," he says. “One day I'll be preppy, next day I'll be super-urban, then I can be all tattered and '50s. I like to keep an open mind." In the studio, he sports knits and crop tops, and dyes his hair funky colors when the repertoire allows. It works well for ballets like The Sleeping Beauty (in which he wears a wig) or contemporary work. “But if I'm playing Romeo, this wouldn't make sense," he says. Whiteside is influenced by everything from Japanese anime to '90s boy bands to New York City itself, a place he's always wanted to live. “It's so inspiring walking around the city," he says. “Some people are just killing it. Anybody can buy fashion, but having style is a completely different thing." Marc Jacobs jacket and bag: “Marc Jacobs is the brand I have the most items of. I'm a huge fan. It's classy and sort of irreverent, and it just looks good." Sandro turtleneck: “This is from a Parisian fashion house and I really like their stuff. It's feminine and butch all at once." Club Monaco pants: “I call these my Bing Crosby pants. They're a really retro fit—wide hips and high waist, pleats, slightly cropped. It's a shape I really appreciate." Crop top: “I adore crop tops for ballet, I think it's hysterical. And I get so sweaty that it's nice to have a little bit of extra air." Yumiko shorts: “I like to wear light-colored clothes for ballet." Bubenicek booties: “These booties are amazing. The name of the color is Avatar, like the movie."